One issue that almost all observers seem to agree upon is that the Department of Education is unlikely to accept the Office of the Inspector General's (OIG's) recommendations to declare Western Governors University (WGU) a provider of correspondence courses and to force the school to pay back more than $700 million in Title IV funds. It would be a mistake, however, to dismiss the audit findings that attempted to add new interpretations of distance education requirements for "regular and substantive interaction", a topic I mentioned on Friday. Ah - where we differ is 'CBE juggernaut'. I think movement is fragile and this audit, even if unimplemented, will affect other decisions. The IG’s report and recommendations go to Federal Student Aid, which decides what, if any, action should be taken. (The “if any” is directly from the IG transmittal.) That involves a further, and often lengthy, review process. The ultimate decision authority is the Secretary. I'm not counting on institutional leaders using the argument "I'm not worried, Betsy DeVos has my back". The longer the review process drags on, the bigger the impact. Another important variable is the extent to which the ED will reject the findings - will they reject the audit in its entirety and take no action, or will they accept some of the findings? Keep in mind that the argument about WGU providing self-paced courses and rejecting the institution's claims to be a term-based institution are much stronger than the argument behind the OIG's arbitrary interpretation of regular and substantive interaction. The impact on WGU itself is most likely a matter of whether perception drives enrollment down. WGU clearly spent a lot of time and effort this summer preparing their web site to deal with the fall out. The central theme is to attempt to reassure current and prospective students that WGU "students, graduates, and employers of our graduates can rest assured that WGU’s accreditation and financial aid eligibility are intact". Students don't follow all the details of political maneuvering and and even less of OIG audit reviews, but the perception that WGU's status as a qualified distance education provider is at risk, therefore making the value of the degrees and likelihood of financial aid at risk, will add a barrier to enrollment decisions. I don't suspect WGU can sweep this under the rug - they will have to go public as they have done with web site and hit this topic head on. In my estimation, however, this will be a matter of a reduction in WGU's enrollment growth, or possibly a drop, and not an existential problem for them. WGU has a 20-year history, more than 83,000 students, full institutional commitment to fight this audit in public, and a lot of clout in Washington with bipartisan support of their model - a rarity these days. Obviously the audit was specifically on WGU and not SNHU. CBE is all that WGU does, whereas SNHU has a fast-growing traditional online set of programs that provides the majority of its enrollment. SNHU's College for America is a business-to-business model, working directly with employers rather than being a consumer program targeting individual students as WGU does. It will be a lot easier to control the message and reassure partners in the B2B model. There could be some impact to SNHU and College for America, but again this is likely a manageable problem for these large schools. 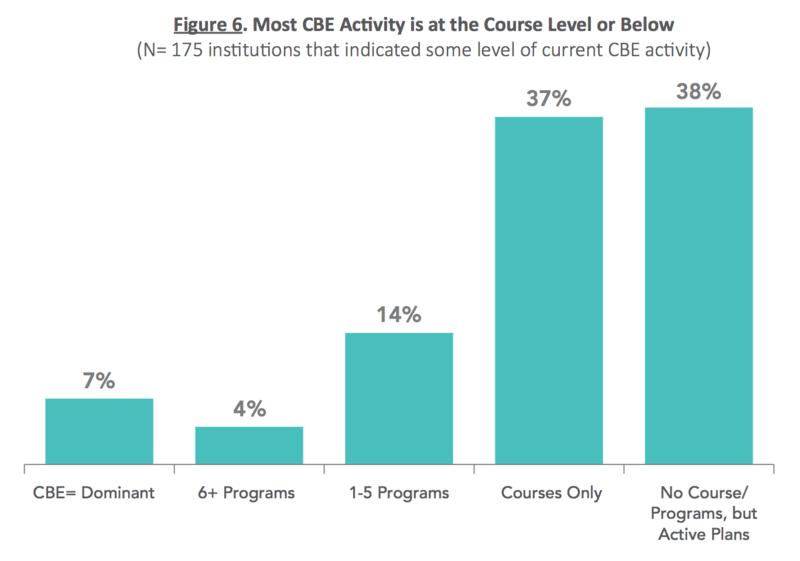 The bigger impact in my estimation will be on the other CBE programs in operation or in consideration, and this gets to the fragile movement comment. Both WGU and SNHU have gone all-in on CBE. They invested heavily in developing the models, they have worked with employers to understand needs, they already have thousands and thousands of students and are growing enrollment, and they are fully committed as an institution to the concept and implementation of full-fledged CBE and not just CBE-lite. But both schools are outliers in the broader CBE movement. Last year, Ellucian partnered with the consulting and research firm Eduventures and the American Council on Education to survey 251 colleges on their competency-based education strategies. The survey identified one major reason why the competency-based education market may be a tricky one for vendors to build a profitable business model in: most colleges aren’t ready to go all in yet. The study found that only 7 percent of the colleges surveyed said they delivered most of their education using a competency-based model. Many more colleges said they were at the point of testing competency-based education in individual programs (18 percent) or courses (37 percent). For most of the CBE programs that I have seen, we're dealing with dozens, or perhaps hundreds of students. The University of Wisconsin's UW Flex program - one of the best known outside of WGU and SNHU - has only grown to 5 degree programs, 3 certificate programs, 1300 students in total, and $2.8 million in annual gross revenue. And the vast majority of programs are much smaller than that. Read the Eduventures 2016 report (the same one referenced by Ellucian in the IHE article) for additional perspective. Rather than a single, dominant version of CBE, our 2016 survey data reveals a diversity of practice across a spectrum of schools, each deploying and experimenting with CBE in order to meet specific institutional challenges. A portrait of CBE emerges as a menu of tools and practices, rather than a monolithic approach or linear path. These findings underscore the need for institutions to carefully weigh the pros and cons of CBE implementation, and to proactively select the CBE components that make the most sense for their students and mission. The challenge is that CBE calls for a new organizational model and a new pedagogical design in order to make it work, at least in a self-sustaining manner. It is great to see hundreds of schools experimenting with new methods to reach non-traditional students, but none of these programs will last if they do not get sufficient scale to justify the costs. But very few schools are even looking at how to get to thousands of students and determining what investment and organizational setup will be required to get there. This isn't as simple as flipping a classroom or two. When you add in the WGU audit results, this challenge gets much harder to address. It will be much more difficult to justify investing in CBE programs or partnerships, or expanding beyond a pilot, when the audit provides marketing copy for those would resist CBE at traditional schools. The California Community Colleges’ Board of Governors today approved a new partnership with Western Governors University (WGU) that allows graduates of California’s 114 community colleges to transfer and seek their bachelor’s degree at a discount from the fully accredited, online institution. The agreement goes beyond pre-setting up transfers. It also is meant to encourage CCC students to move to WGU for their bachelor's degree, where appropriate. There are terms for a 5% discount for CCC students, and there is a section on joint marketing. This news comes at the same time as the active debate on the CCC system being directed to create a fully-online college serving non-traditional working adult students. These are dramatic proposals for the largest higher education system in the US, and there is bound to be plenty of opposition to such plans from faculty unions and other groups skeptical about changes in model. I suspect that the political climate in California just got a lot more difficult in terms of implementing both initiatives, and I suspect that the option lists available for setting up the new online college is shorter than it was last week. To be clear for those who have not read the first post, I consider the audit a travesty. The CBE movement and individual programs deserve scrutiny to ensure quality education for students, but this audit and its impact will do nothing useful to protect students or ensure quality.